This blog is maintained by Stephen Filler, a New York-based attorney with expertise in business law, contracts, intellectual property and litigation. He represents a wide variety of businesses, technology, media companies and individuals. He also provides legal and consulting services to sustainable, environmental and renewable energy businesses, non-profit organizations and trade organizations. He is on the board of the New York Solar Energy Industries Association and Secretary of the Hudson River Sloop Clearwater. His business website is www.nylawline.com. The Green Counsel consulting website is www.greencounsel.com. A USA Today/Gallup poll last week found that 42 percent of the roughly 1,000 adults surveyed across the United States believed President George W. Bush’s administration had “deliberately manipulated the price of gasoline so that it would decrease before this fall's elections.” The White House, or course, denied it. But given the strong ties of the Republicans generally, and this Administration in particular, with the oil industry, the industry has every reason to help the Republicans hold onto Congress, and polls make clear that Bush's popularity has always been tied to the price of gasoline. It doesn't take a "conspiracy" with the White House, or even overt collusion among the oil companies, to achieve the desired effect. The power of the industry is staggering, and the Bush/Cheney/Energy Alliance is one of the greatest barriers to sustainability that we face. Fascinating story on NPR's Morning Edition this morning about Philadelphia's goal to reduce rainwater runoff that pollutes local rivers and causes flooding. 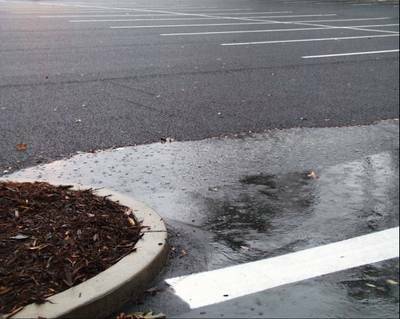 Philadelphia will use porous pavement to create places where rain is quickly absorbed into the ground, rather than sheeting off. Not only will basketball courts allow water to run through them, but they are dry immediately after the storm! Below is an example from the University of North Carolina's Sustainability Office of traditional pavement in the foreground with porous pavement in the background during a rain shower. Dr. Richard Perez, who does excellent work at the University of Albany demonsrating the viability of solar electricity, just issued this report showing how effective it can be to place solar photovoltaics on parking lots. The bottom line: there is enough space on parking lots in the Hudson Valley, New York City and Long Island to displace about 15-20% of the region's peak electrical demand with PVs. Dr Perez's other studies can be found here. No -- it's not a new children's toy, but rather a whole arsenal keep large box retail stores out of your community. The Institute for Local Self Reliance has just launched a valuable new website, www.bigboxtoolkit.com, designed for people who want to stop big-box proposals -- whether because of their adverse effect on local economic development and small businesses, traffic congestion, environmental issues, community impacts, or low-paying jobs. The site explains how to navigate local land use policies, how to organize a citizen-based campaign, and how to enact local policies that put citizens in control of community development. It even includes a model store size cap ordinance, and an interactive map showing communities that are fighting big box stores. The website notes that more than 200 big boxes have been blocked since 2001 through the local land use laws -- many of them through the help of the Institute for Local Self Reliance. 1) California's annual per capita electricity use has been almost flat since the 1970's, as the rest of the country's increased by more than 50%. 2) California's recent decision to cut CO2 emissions by 25% by 2020 is predicted to add $60 billion and 17,000 jobs to the California economy by 2020. 4) In August, California passed a bill requiring builders to offer home buyers roofs with solar electric tiles. 5) California -- which for years has required large appliances to be energy efficient -- now imposes similar requirements on cellphone chargers, computers, and remote controlled devices. (It is estimated that chargers and "vampire" appliances that draw power even when they are off use up to 10% of an average home's power). 6) Since 1982, California has "decoupled" utilities sales from profits so that utilities make more money when customers to use less electricity. Every other state rewards utilities for selling more energy. 7) California's huge pension fund, Calpers, is committing just under $1 billion to renewable energy investments. 8) Investor-owned eletrical utilitities in California cannot sign long term contracts to buy energy unless the seller meets stringent emissions standards that cannot exceed those of the cleanest gas-driven plants. Since California represents 40% of the total electricity consumption in the West, this is affecting power producers in the many western states that produce California's electricity. 9) California law prohibits construction of nuclear plants until questions of waste disposal are resolved. The article is entitled "California, Taking Big Gamble, Tries to Curb Greenhouse Gases." The article fails to note the even bigger gamble that others are taking by doing less. Copyright 2006-2007 Stephen Filler. This work is licensed under a Creative Commons Attribution-NonCommercial-NoDerivs2.5 License.